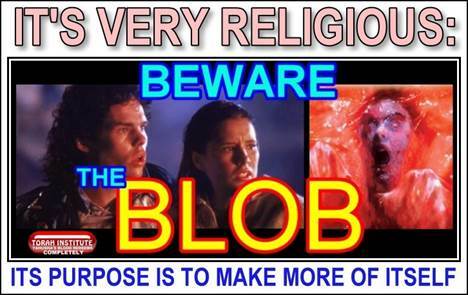 The 1958 movie, The Blob, could be a metaphor for how religion takes on a life of its own, and everyone is absorbed into it. The purpose of its existence is to make more of itself. 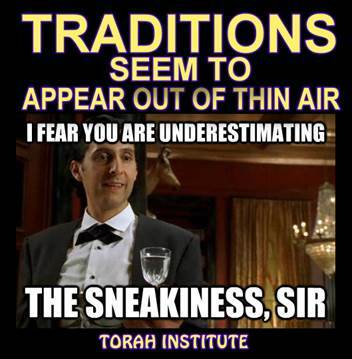 YirmeYahu 16:19 shows we've inherited lies through traditions handed-down to us. Religion is tradition, and it develops over time as it corrupts itself by men guided by their minds of flesh. Yahusha's yoke is light, without ritual, liturgy, or hierarchy. We have direct access to His love. He created each of us to be His companions, and His Torah is instruction for us how to love Him, and how to love our neighbor. Torah points to the ideal relationship for bearing the perfect fruit of good behavior. Ecumenical means “world-wide” and promotes the blending together of all faiths under one unified entity. The New World Order seeks the same thing politically and economically. The centralization of authoritarian control is not hidden, but is in plain sight: the UN. An “initiative” of the UN is called the U.R.I. - United Religions Initiative. We were in the blob until Yahusha called us out of it. Now our minds are controlled by Him, not the blob. This new article may help many people awaken to what they are trapped in. Strongholds of thought hold people’s minds captive until they can reach outside their prison and take hold of the Truth. Being in the blob is a metaphor for being controlled by the beast. The beast compels everyone to obey it, and is in opposition to the Covenant of Yahuah. Yahusha is releasing the captives, and restoring us to His Covenant of love. Religious tradition is the Blob, blindly performing its purpose of absorbing, growing, and competing for dominance. The Covenant is the marriage we will celebrate at the marriage supper, and the Blob serves the purpose of annihilating it. Our choice: the Covenant (life), or the Blob (death). The BLOB is the beast, or World Order begun by Nimrod. Question: What is the leaven, or yeast of the Pharisees? Answer: Rabbinic Judaism, the traditions of the fathers. WHERE DID THE IDEA OF A RABBI COME FROM? A guide to reach fulfillment, or guru, came from the culture of Hinduism. This reached the Middle East about the 2nd century BCE. It came from India by way of the trade route known as the Silk Road. "Yoking with forces" to achieve higher chakra levels, and "four levels of interpretation" both originate from Hinduism. Mosheh, Danial, and all other prophets never mentioned the rabbi. Are teachers trying to convince you of codes, numerical secrets, higher levels of knowledge, or that you need the covering of another "enlightened" man? 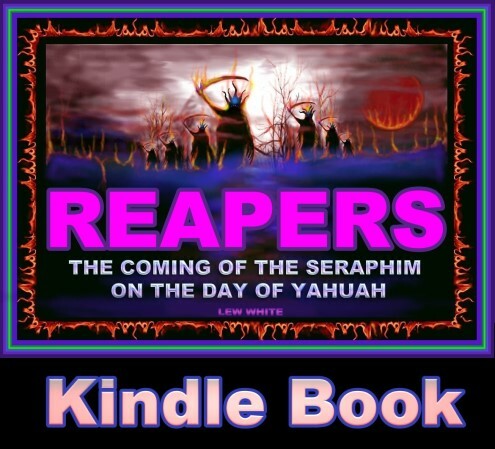 At Yahusha's return, all rabbis but One will become extinct. If rabbis are never recommended in Scripture, nor will they be around after Yahusha returns, why are people pretending they need rabbis? Yahusha is our covering, and His blood redeems us completely. Paul referred to his “former way of living” in Yahudaism (the traditions of the fathers, Galatians 1:13), which was the way of the rabbi, called rabbinical Judaism today. Rules made by men have come to supersede the Commandments of Yahuah. We are not to add the rules of men, or do what seems right in our own eyes. Mark 7:6-7: "And He answering, said to them, 'Well did YashaYahu prophesy concerning you hypocrites, as it has been written, "This people respect Me with their lips, but their heart is far from Me. And in vain do they worship Me, teaching as teachings the commands of men."'" Romans 10:2-3: "For I bear witness that they have an ardour for Alahim, but not according to knowledge. For not knowing the righteousness of Alahim, and seeking to establish their own righteousness, they did not subject themselves to the righteousness of Alahim." Rather than wearing the tsitsith (Dt. 22, Num. 15), men invent “standards” like wearing long-sleeve white shirts with a tie before they are allowed to teach in their assemblies. They call Yahuah’s Word “the Bible,” eat swine’s flesh, and profane His Shabath. We must not be of different opinions, or divided (1Korinthians 1:10). The world is overtaken by religious traditions. Yunah in Nineveh did not warn them to obey traditions, and neither did AliYahu (Elijah) or Yahusha. The message could not be more simple. 1. Love Yahuah with your whole heart, mind, and being. but men’s words are like chaff the wind blows away. Many things will not survive the Second Coming. The 7-day week will still exist, but we will not be calling the days by the names of pagan deities. We have to decide between tradition (religion) and Truth (reality). Get rid of the leaven of men’s teachings now, they won’t survive the Second Coming. The colonies of the British Empire brought the English language to the whole world, and today it's the language of business. From sundown to sundown, our household does no buying and selling, cooking, or traveling unless there's an emergency that threatens life or property. Yahusha spoke of the last days (Mt. 24) telling His followers to pray their flight not be in winter or on a Shabath. The Day of Yahuah will come on the most solemn annual day of rest, Yom Kafar, in the 7th moon one year. It’s called “the FAST” at Acts 28:11. 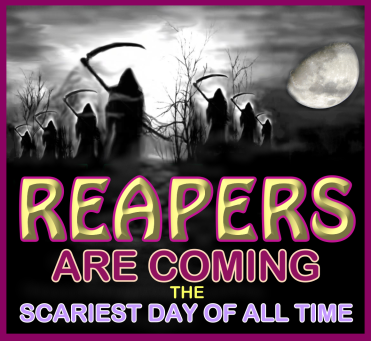 Reapers (eagles, the seraphim) will remove the weeds first, then gather the wheat into the barn (New Yerushalayim). Rev. 13 is a riddle, and the mark concerns buying and selling. Those not having wisdom (Torah) cannot calculate the meaning of the riddle. The reign of Babel (the beast) has Nimrod's mark, as he was worshipped as the Sun. Sunday is his mark of authority over the world system, the beast. "Let no man therefore judge you in meat, or in drink, or in respect of a festival, or of the new moon, or of the Shabath days which are a shadow of things to come for the body of Mashiak." Being Lured Away? Stand Firm! How about the idea that all of us move close to one another so we can be together and away from the lawless unbelievers? Some want to move to the land now, in advance of the regathering. Some are being lured to move to other places just to be with other believers. 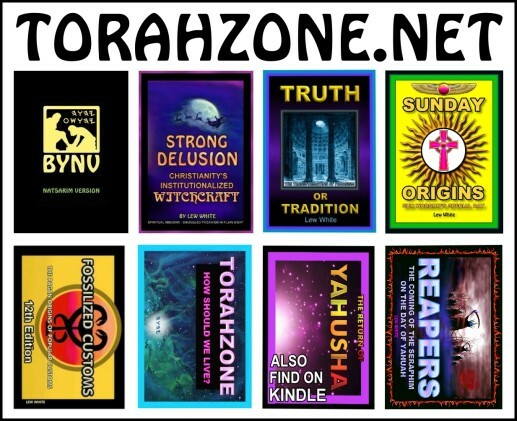 There is a time coming when we will all live with other Torah people: when Yahusha returns. For now, we are salted among the lost. If we leave from where Yahusha awakened us, those who are lost around us will perish and we will have abandoned our post. Instead of being where Yahusha planted us, we would be bunched-up together and going on with our own happy goals, and be of no use to the lost. We are not sent to the well, we are sent to the sick. For 37 years I labored among New Agers, Hindus, witches, murderers, thieves and lost Christians, and from that experience I saw many turn away from their way and follow Torah, becoming fellow laborers in the harvest. 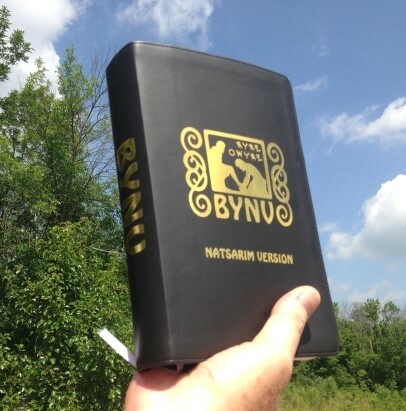 Many times I've been invited to move to a community of other Torah-observant folks, but if I had done so, those Yahusha intended for me to find would have been abandoned. Don't put the Light under a basket. Be Yahusha's Light right where you are. Remain a faithful servant; one day He will allow us to all be together in one place, the Wedding Supper - to celebrate our marriage to the Sovereign of the Universe. 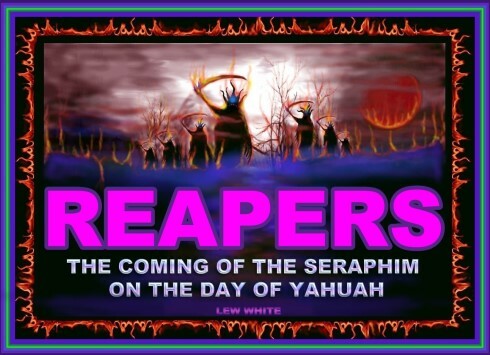 The coming of the seraphim (fiery-ones) on the Day of Yahuah will be the great harvest of the Earth. It will come unexpectedly, and be very fierce, like a lion attacking its prey. On an appointed day, they will remove the weeds first, then gather the elect for the wedding feast of the Lamb. That appointed day is one of the appointed-times, the day of the Fast (Lev 23:27, Acts 27:9). This book will take you on a tour of Scripture to help prepare the elect for this great and awesome Day of Yahuah. Watch for the printed book to be released.